Are you in a bind and working late? While many of our competitors close their doors to shipping new orders at 5 pm, our shipping department is in full swing picking and packing orders. As long as what you need is in stock and you place your order by 8 pm eastern time, we'll guarantee it will ship out the same day. That means less worry and stress about that last minute project addition or that critical piece of gear that you need immediately. Why Do We Stay and Ship Late? When you have late day meetings, budgetary pressures, and management decisions, you're left with little margin to do your job well. While you're rushing to finish out your day, we run alongside you to help take care of your priorities. Mayday! Mayday! Something went down today. Now, you have to stay late to get it back up and running or a least find a band-aid solution to plug the leaky ship. You don't have to do it alone, we're here until 8 pm shipping out orders. 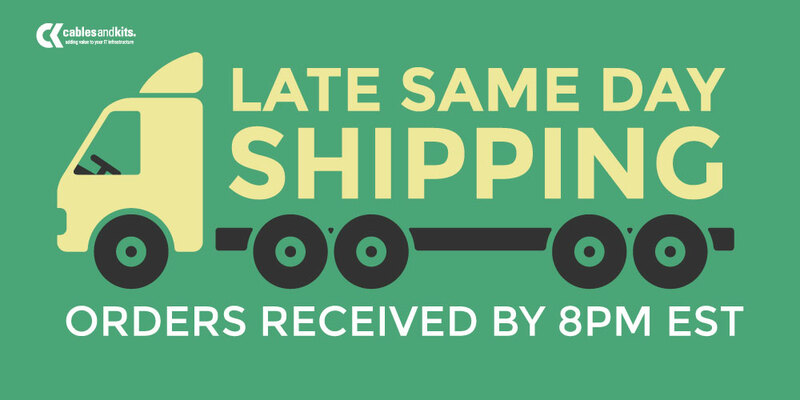 There are numerous reasons why you need someone there to ship out your order until 8 pm ET. Whatever your reason, we want to stand alongside you and resolve the problem. When placing an order with CablesAndKits you will be presented with several shipping options during checkout. Except for special circumstances we prefer to ship FedEX. If there is a special reason that you need to ship via a method we do not offer on the website please contact us. If part of your order is out of stock and you choose FedEX Ground as your shipping method we will ship your order when the out of stock items are received. If part of your order is out of stock and you choose a FedEX Express service we will contact you to see if you would like the in-stock portion of your order to ship that day or if you would like us to wait for the remainder to arrive before shipping. Other unexpected exceptions may apply that may be specific to the situation. Please be sure to make any changes to your order by 3 pm on your order date. After this cut off time, we may not be able to adjust the order as it may have already been picked up. Delivery is via common carrier (USPS, FedEX, UPS, etc) to most areas in 5-7 days. Please expect this order to be shipped from our warehouse within 1-2 Business days. Orders being shipped Freight, International or to Hawaii & Alaska do not qualify for Free Standard Shipping. Contact us if you have any questions! Delivery times vary depending on the date the order is shipped, the shipping and delivery addresses, and other factors. FedEX is reliable when it comes to their transit times so once you receive a tracking number from us you should be able to estimate with accuracy when your order will arrive. Once you receive your tracking number you can visit the FedEX website to track your package. The tracking information usually contains the estimated delivery date which is usually accurate. The FedEX site is www.fedex.com. For international shipments, the customer will be responsible for any duties, taxes, and/or brokerage fees which may apply. These extra fees are not included in the product price or shipping and handling cost which will be collected from the carriers on delivery, as applicable. Please check with your country's customs office to determine the additional costs. A delay of up to 7 days may occur for certain countries. Please contact us if you have any questions about International Shipments. If your order is lost or damaged during transit we will handle the claim with the carrier to save you the time and aggravation. We will also replace your order, up to the insured amount ($100 by default), as soon as the carrier has processed the claim. This can be a complicated procedure, please contact us if you have any questions about it. The good news is that packages are rarely lost and the items we sell are hard to damage.